July 27, 2015 By Elizabeth Lindemann 5 Comments / This post may contain affiliate links. Goodness gracious. These Chicken Parmesan Sliders are delicious. DELICIOUS. I don’t know if I can put into words how I truly feel about this meal. But I have to try, since I um, write about food. Because, you know, food blog.
. They really have the BEST recipes!). And they are easy to make in bulk and freeze for later, or feed a crowd easily! I hope you already know how delicious chicken parmesan is. Traditionally, it’s a fried cutlet of chicken smothered in marinara sauce and mozzarella/parmesan cheese, topped with fresh basil and served with a side of pasta. It’s hard for me to order anything else at an Italian restaurant, since it’s almost always guaranteed to be yummy! 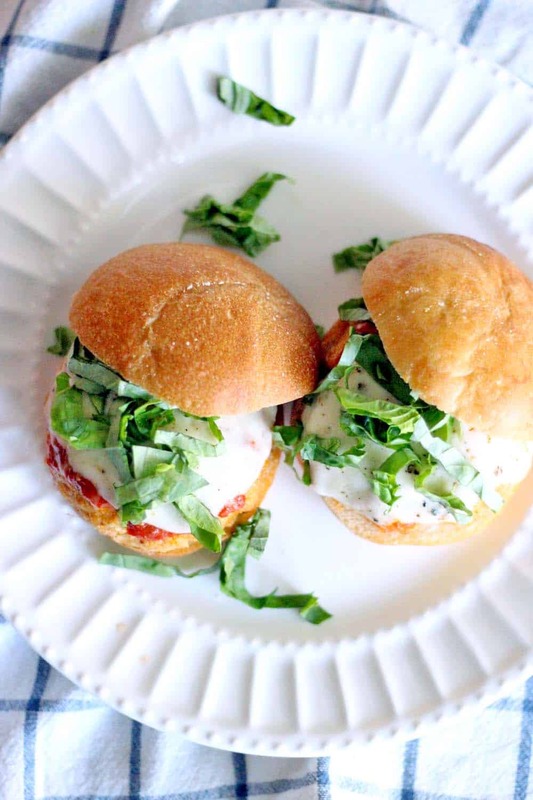 These sliders take the same idea of chicken Parmesan but make small burgers out of it. Here’s the basic gist: you make small burger patties out of ground chicken, coat them in bread crumbs, bake them, and broil them with marinara and fresh mozzarella. 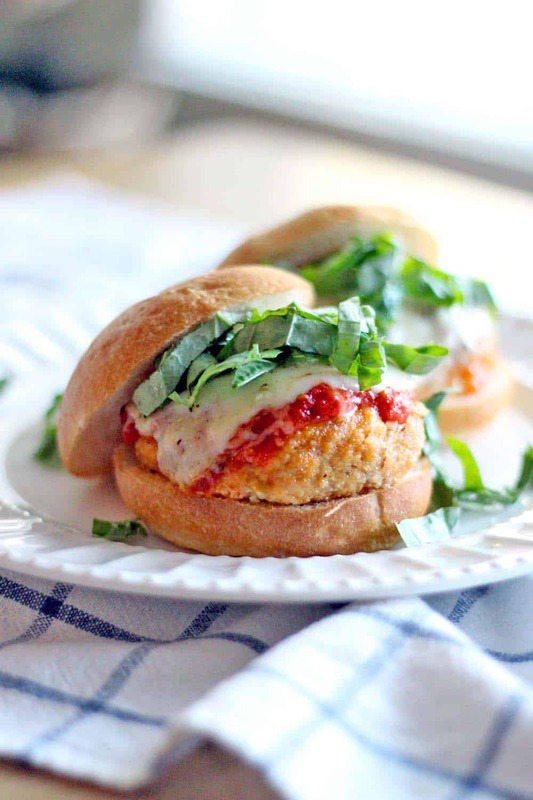 Top with fresh basil and put on a slider bun, and you have the best of two amazing worlds: burgers, and chicken parmesan. It’s heavenly. And here’s the thing: these are healthier than both traditional chicken parmesan and traditional burgers.
) to make it a bit faster, use fewer pots and pans, and make a bulk recipe so I could freeze half of it for later. Oh gosh, that reminds me! I have these in my freezer!! I can literally have them whenever I want to! It’s like when you leave money in a winter coat and don’t realize it’s there until the next winter. Surprise money; surprise chicken parmesan sliders. I should really try and resist the temptation to eat these within the next month so that I have a nice surprise later on. 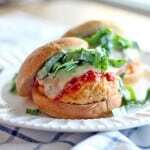 These Chicken Parmesan Sliders are easy, freezable for later, and can easily feed a crowd. Absolutely DELICIOUS- it's like a burger and chicken Parmesan had a baby! 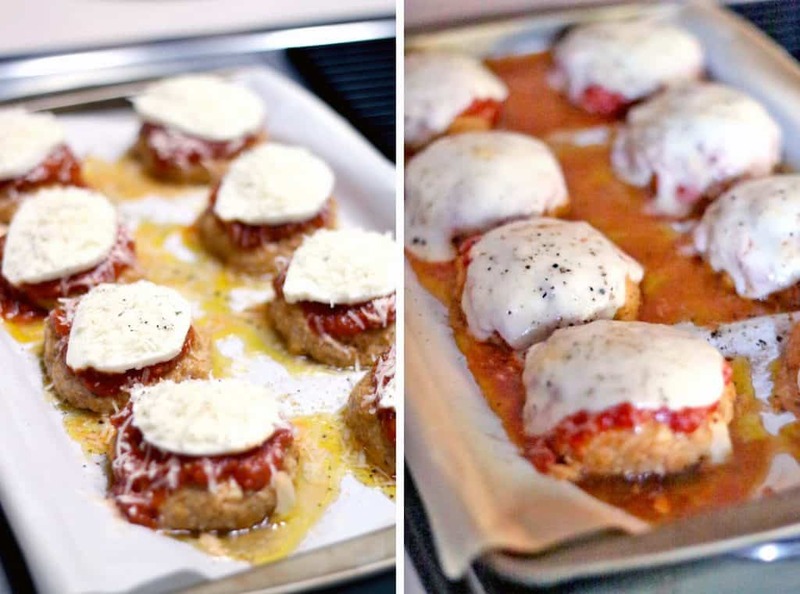 Line a baking sheet with parchment paper and preheat oven to 400 degrees F.
Mix together chicken, onion, garlic, oregano, crushed red pepper, salt and pepper, 1/2 cup marinara sauce, and 1/4 cup Parmesan cheese in a bowl (for best results, mix with hands). Place bread crumbs in a shallow bowl. Form eight patties from the chicken mixture, and coat each in bread crumbs. Place on prepared baking sheet. Drizzle the patties evenly with the olive oil. Bake at 400 degrees for 20 minutes. Remove from oven, and turn broiler on high. Spoon the remaining marinara sauce on each patty and top with a slice of mozzarella cheese. Sprinkle with remaining Parmesan and top each with fresh cracked pepper. Broil for 3-5 minutes, or until cheese is bubbly and melted. This recipe makes enough for four people. I doubled it when I made it- I recommend doing this so you can freeze half for later! To freeze for later: lay formed and bread crumb coated patties on a parchment covered baking sheet and place in freezer for at least 20 minutes to flash freeze. Once hardened, transfer to an airtight container or plastic bag and store in the freezer for up to six months. When you are ready to eat, arrange on a parchment covered baking sheet and defrost in the fridge for 24 hours before baking. You can make these into normal "burger-size" patties as well- make four, instead of eight, and purchase larger buns. I’m going to make these for a family function. If I made them burger size, how long would you bake them for? Not too much longer- maybe about 25 minutes instead of 20! You can always use a meat thermometer to double check the internal temp if you are concerned about it. Hope you like them! I love this recipe! Bonus that it’s freezable. It looks like the type of thing to keep in the freezer for those times when you just don’t have time to cook, yet fewer preservatives than the frozen convenience food that you’d buy at the grocery store. Yum! That’s all I can say! !